For your viewing pleasure, I’ve created a brief house tour video. This is for all those folks who are shocked/amazed/mortified that our family lives in ~750 sq ft of space. Of course, if we were in Japan, we’d probably have half this space and call ourselves lucky. But here in SoCal, our ‘living small’ lifestyle is definitely an anomaly. The tour is limited to half of our home, so you’ll miss about five bookshelves (primarily the kiddos’ books and our magazines and journals). TobyJoy decided not to make an appearance in the show (EllyCat is the star) and John, CatGirl and GameBoy were at school during the tour, so the house is pretty quiet. One note: I mention that the table in the LR is “my desk,” well it’s also the heart of our home. We eat meals, watch movies, play games, read books, pray, and entertain guests around this table. Even as I type this post, John and I are working on our laptops at the table, and CG has a whiteboard that she’s drawing on at the table. PS: kudos to John for helping me to compress the video for youtube! lavender with bee, originally uploaded by pilgrimgirl. I spent several hours this weekend in my garden. It was bliss. I pulled weeds, watched insects, and chatted with my neighbors. I also ate mostly out of the garden because I was on my own and I’m quite content with a lunch of grilled zucchini. I know everyone isn’t as enthusiastic about gardening as I am–what are your magical/blissful spaces and places? lantana orange, originally uploaded by pilgrimgirl. pilgrim classic: Saint or Sinner? Are you good? Are you bad? A host of consequences hangs on the answer. Yet, a brief experiment can easily convince you that the question, so grave in appearance, has little foundation. Consider how you spent yesterday. Retrace the main events, how one led to the next, and, as far as possible, reconstruct the thoughts that went with them hour after hour. And then, if you have carried this out completely enough, try believing in moral judgements and the searchings of conscience. What have you learned? In worship yesterday I felt lightness, love, goodness. A closeness with the spirit. I reached out to newcomers after Meeting. I ate lunch with friends and enjoyed their thoughts and their humor. I ate a divinely-tasty egg salad sandwich. I spent time interacting with my kids and John in the afternoon. I did the family’s laundry rather than spending time on my own tasks. Assembled a favorite salad to share with friends at dinnertime. Was gracious to Friends for their hospitality, etc, etc. Slept in and was grumpy in the morning, as usual. Was testy with John and the kids because I was ready for Meeting before they were. Got to church late, despite having arranged to meet newcomers there beforehand. Resented some disruptions during worship. Had difficulty quieting my mind. Thought mostly of myself and all I want to/need to do. After meeting, left fellowship early to spend time with my friends. Ate egg salad sandwich for lunch w/no remorse about consuming animal protein. After dinner, poked fun of 50s movie and traditional Quakers. Tried to be funnier to impress friends. Thought more about how I was feeling than about others. Didn’t reach out to those I didn’t know well. There are no ordinary people. You have never talked to a mere mortal. Nations, cultures, arts, civilizations–these are mortal, and their life is to ours as the life of a gnat. But it is immortals whom we joke with, work with, marry, snub, and exploit–immortal horrors or everlasting splendours. It seems to me that we are, all of us, both gods and devils simultaneously. We are selfish and selfless in the same moment. And as such, we should be gentle with judging ourselves, and also with judging others. And the world was richer for her….. Photos: Top photo is a close-up pic of a deep pink and red rose. Bottom pic is a closeup of an orange and black butterfly with wings spread, sitting on a helitrope bush with bright green leaves and purple flowers. I’ve been feeling resonances of this post as I’ve dealt with the various challenges of this past week, and especially as I’ve tried to understand how the excommunication and the murder are affecting my kids’ sense of security. This was originally posted on August 7, 2008, just a week after the surgery to remove the infected tissue from my left leg. I have a ritual that for my twice-daily wound dressings. It involves the expected hand-washing, opening of sterile wrappers, cleaning and laying out of tweezers and scissors, a dousing of the affected area with saline. Then I start to breathe. In my yoga practice my teacher taught us to send energy through our bodies by imagining a furnace sitting at the base of our spine. With each breath in we stoke the fire of that engine, make it burn hotter and brighter, and as it enlarges and warmth shoots down our legs and arms–creating arcs of energy that spit out of our finger and toe tips. While I am doing a dressing change and I breathe this way I am less interested in shooting sparks out my fingers bit–rather, I imagine a pinwheel of fire in my belly that sends its light to my leg. The light warms and soothes the tissue, preparing for the moment when I have to grab the tip of the gauze that’s packed into the wound and pull. It doesn’t come easily–it is packed in with pressure and cemented by blood and slubs of new tissue. And that’s exactly the point–the pull debrides the wound, “cleans it,” keeps it open. For me it is a horror to hurt myself that way–to rip open a sore that is doing its best to heal closed. To tug at the tissue that is so raw and tender from months of inflammation feels counterintuitive from my deepest fibre. I find that it’s only when I breathe my special way that I can make my hand do what has to be done. As I performed my ritual this morning, my mind stuck for a moment on how “this has to be done.” In my case it has to be done in order for my surgery to be effective. But I let that thought expand and enlarge as I thought of other times in my life that I am doing what “has to be done.” I thought of my life as an amputee, how much of that is simply finding ways of doing what “has to be done.” Walking with a prosthesis, ignoring the stares of passersby, standing unselfconsciously in front of a classroom–not easy things, but to me they are not courageous, heroic or unusual. They are a means to an end. I have little choice in the matter. Like the gauze that must be pulled, I cannot change my physical difference. It is what “has to be done” for me to move through my daily life. Although I didn’t articulate it in this way when I first began blogging, I would say that most of my online writing (at least on my personal site), is my attempt at making peace with the “what has to be done” of my life. A big part of that is writing about my disability. Because it’s so often difficult to experience the pity of complete strangers, I need to discuss what that feels like. I need to tell the story of what happens when a one-legged woman walks into an athletic facility or is harassed by TSA employees at the airport. Last night as I was hobbling across the living room in frustration–trying to walk on my fake leg and my wounded leg and taking one big leap to the sofa because I just wanted to get off of both of my feet as fast as possible, my daughter came over to comfort me. She expressed her sympathy at hard it must be for me to walk right now. I was angry and tired and hurting. I looked up at her standing over me and suggested that her life might be a whole lot better if she’d been born to a Mom with two good legs. A Mom who could be outside playing and running and not one who had to ask for help each time she needed to use the toilet. I think CatGirl understands a lot about “what has to be done”–maybe more than I do. She knows that you only know what you’ve experienced and that’s that. So “what has to be done” for her is to be gentle with her Mom when she’s healing, to refill my water cup, to not complain as she trails alongside me through clinics and hospitals. She hears me scream and cry when I’m hurting and she takes in in stride. This afternoon she patiently helped me clean off all of the adhesive residue that was still stuck to my arms from my latest round of IVs–knowing that I couldn’t reach the goop on the backs of my arms myself. It was “what had to be done” for her Mom. In my family, each of the women make quilts in preparation for their marriage. My mother’s quilt had a white background with intricate blue and green designs embroidered onto the quilt top. My older sister’s quilt was pieced—an Amish-like simple navy blue and white design. I knew I would want something special for my quilt, something that reflected the symbolism of my wedding and also would be traditional and elegant. I became enchanted with ‘whole-cloth’ quilts–where the fabric is all one piece and the design comes from the quilt stitches. I found a design that I liked—a pattern taken from a 19th-century wedding quilt. With interlocking rings and vines, on all-white fabric. I loved the way the rings and circles in the pattern symbolized the eternal union that I desired. And I wanted it to be white, to remind me of the temple and of purity. Yet I knew that a quilt of such complexity would take a long time to create and I ran the risk of never finishing it! But I also knew it was the one. And I wouldn’t be satisfied with anything else. At the time I settled on this particular quilt pattern I wasn’t yet engaged. It was my sophomore year of college and my boyfriend of my freshman year was serving a mission. I was also dating two other RMs rather seriously. I figured that one of the three would be proposing soon enough and so I ought to get started on the quilt just in case. As a Christmas gift my Mom purchased all of the supplies for the quilt and she marked the design on the quilt top. We set up the quilt frame in the Dining Room and began quilting. 1) Quilt stitches are small, often 4-5 stitches per inch. I was planning a king-size quilt with designs so close and complex that there were often multiple rows of stitches per each square inch of fabric (was I crazy???). 2) When you quilt, you have to send the needle through three layers: the top layer of fabric, the ‘batting’ or cotton stuffing in the middle, and the bottom layer of fabric. There’s only one way to know if you’re needle made it successfully through all three layers, and that is to use the tip of your finger to ‘feel’ the needle poke through underneath. This means that with each and every stitch, the tip of your finger is ever-so-slightly pricked by the point of your sharp needle. The upshot: after about 2 hours of quilting, the tips of each finger are full of so many holes that the skin resembles raw hamburger—and are often oozing little drops of blood. At the time that we were making my wedding quilt, I attended a university about three hours from my parents’ home and I lived in the dorms. So I could only work on it when I traveled home on weekends. Which was, at most, twice per month. When I did come home, I would spend much of the weekend bent over the quilt frame. My mother also put in many hours stitching during the days that I wasn’t home. 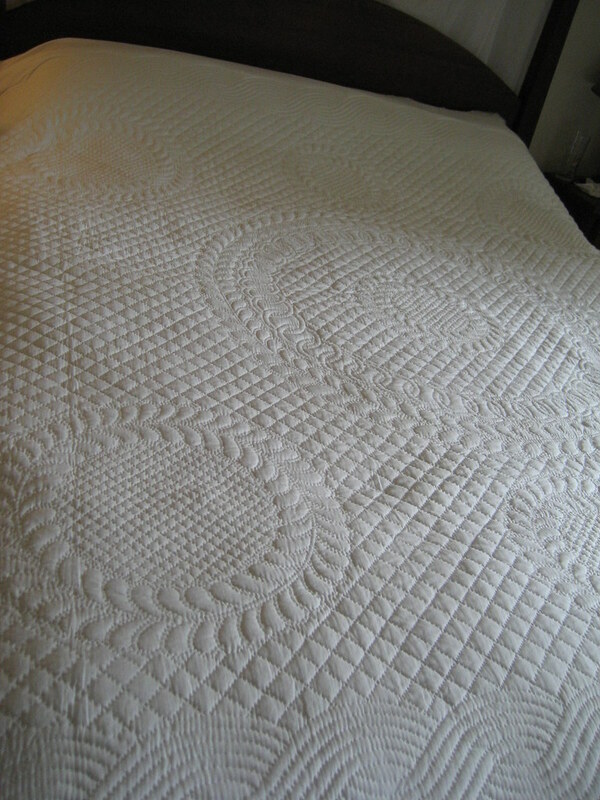 It took us eleven months to complete the quilting. As I sat sewing I had much time for thinking. A lot of my thoughts were about my future. It was as I was sitting over that quilt that I read the letter from my missionary where he said that he intended to propose to me when he returned home from Japan. And as I thought about that for a long time, I decided that my future was with him, and the quilt would someday grace our bed. Ironically, perhaps, even though we married five months after John returned to the States, we have never used this quilt. We have never slept under it. It seems far too precious and too fragile. 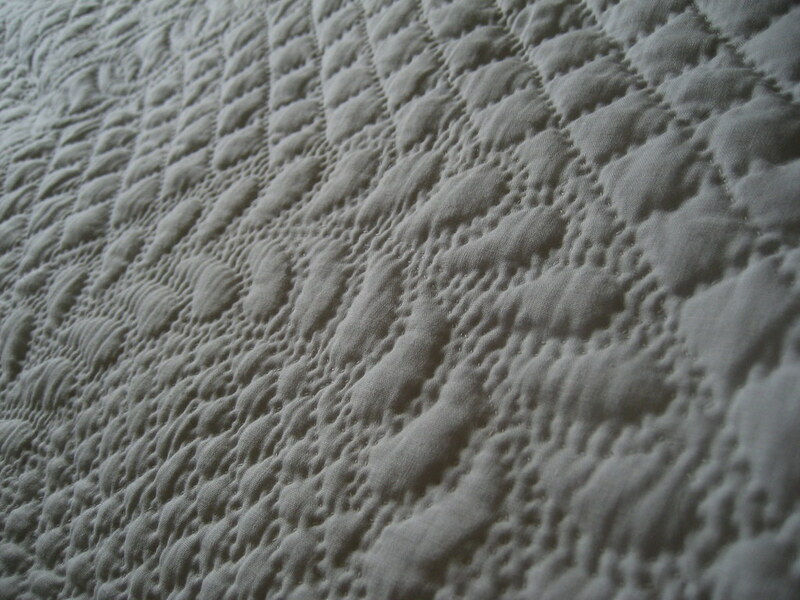 Until very recently, I’ve never felt that I had a bed that was pretty enough for such a quilt. But even now that we have a nice bed, we use an inexpensive (and washable!) matlesse spread. Our wedding quilt is carefully folded in my grandma’s cedar chest that sits at the foot of our bed. Occasionally I take it out and look at it. But usually only when we are moving to a new home. My older sister, on the other hand, put her wedding quilt on her bed for everyday use. My Mother also had her wedding quilt on her bed until it was stained by diaper changes and the messiness of raising five small children. 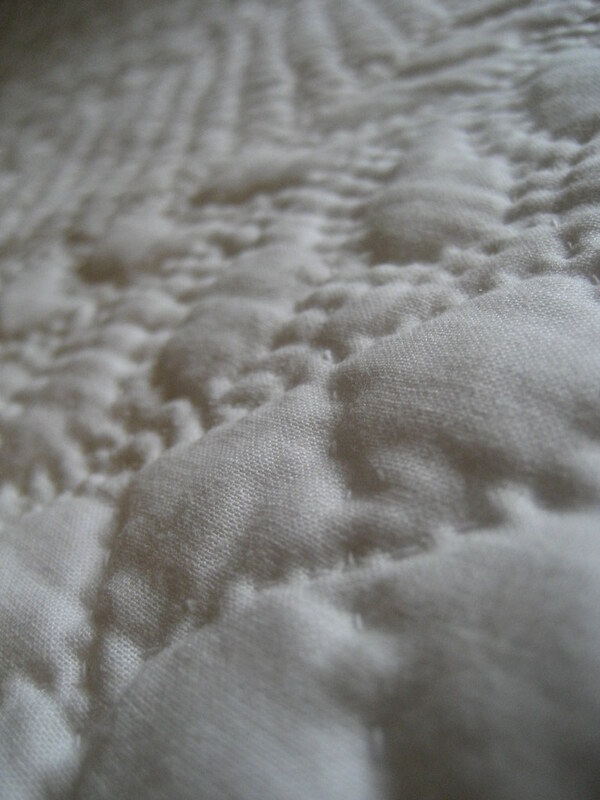 Today, to take these pictures I spread out the quilt on my bed in the morning light. As I did so, my kitties kept jumping up on the bed and frolicking. They wanted to lie in the sun on the quilt. I fretted a bit about the black and grey cat hair that I could see already accumulating in their favorite spots. Then I let myself stretch out over the quilt and I thought about the intention, love, and hard work that I had invested in this one simple piece of cloth. A few yards of fabric, some cotton stuffing, and thousands upon thousands of tiny stitches. Blood, sweat, and tears. Joy. And I thought to myself: What am I waiting for? Why not use it tonight and tomorrow and from now on? I’m taking some new meds and we’re watching carefully for allergic reactions–given that I’ve had some rather spectacular allergic reactions in the past few days. So after taking a new type of pill I called John in to tell him that it was making me kind of itchy especially under my left armpit. After I scratched there a bit (yah, I know I’m not supposed to scratch, but I do it anyways), I realized that there was a metal snap in my armpit. “Can you take a look at this?” I said, lifting up my arm (and do keep in mind that looking into the armpit of a woman who is unshaven and unshowered for the past week is not for the faint of heart). “Yep, it’s a snap,” John said as he peeled off the adhesive metal electrode that must’ve been left there after my surgery. John then took a peek into my right armpit. Ahem, but what is that saying about men (and women) with no feet??? That they exist as morality lessons for all those shoeless joes out there? Or as objects of pity for all those folks whose closets are so full of shoes that they don’t have enough space to keep them in?? ?